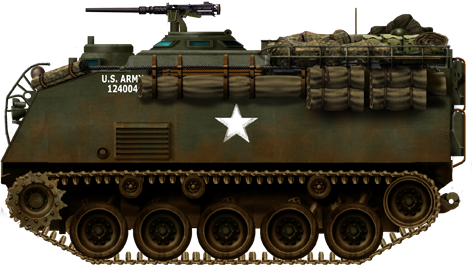 The M75 was only the second American APC, preceded by the M44 (T16) developed at the end of the war in 1945. This was a big vehicle, based on a highly modified M18 Hellcat chassis and engine. It had 51,000 lb of combat weight, carried 24 fully equipped infantrymen, plus the driver, bow gunner and commander. It was thoroughly evaluated at Fort Knox and Aberdeen Proving Grounds in 1946, but ultimately the Army rejected it, arguing it was too big compared to the regular infantry squad of ten men. A handful of these vehicles were built and used for evaluation and then passed onto auxiliary units. They had two side access doors, two front cupolas, vision by periscopes, bow M1919H4 machine gun mounted in a ball mount and a rear hatch ring with a single cal.50 M1920 HMG. Already in September 1945 new specifications called for a squad-sized APC based on the T42/43 tracked cargo carrier. 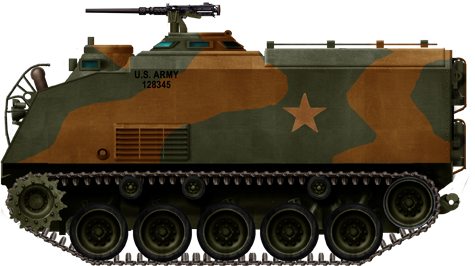 The latter was based on the smaller M24 Chaffee-derived T33, with had a torque converter transmission borrowed from the M18 Hellcat. The M43/T43 was lightened compared to the T42. The T18 development was developed by International Harvester Corporation (IHC) in 1947-48. The latter delivered a first mockup showing a crew of 14, two remote-controlled cal.50 HMGs, usable by the two gunners or the commander. The first T18 prototype (of four) dropped the assistant driver. The T18E1 was unarmed and featured a prominent redesigned commander cupola, modified on the T18E2 with a T122 machine gun mount which could operate indifferently a cal.30 or 50. This vehicle was propelled by a six-cylinder Continental AO-895-2 air-cooled gasoline engine featuring large exhaust grilles on the sides. This weak spot was later eliminated and replaced by a front-mounted pipe. The T18E1 was eventually accepted for service in 1952 and an order of 1000 was placed to IHC and another 730 to the Food Machinery and Chemical Corporation (FMCC). For maintaining low costs, the original two fuel tanks were replaced by one, the shock absorbers were halved, and the auxiliary generator was eliminated. The new T18 design shared many similarities with the M44, but had access/exit doors relocated at the rear, and moreover, the chassis was shortened by eliminating one pair of roadwheels, to five roadwheels and three return rollers per side, the drive sprockets at the front and idlers at the rear. The chassis/suspension components were shared with the M41 light tank, the Continental AO-895-4 6-cylinder air-cooled gasoline providing 295 horsepower (220kW) at 2,660 rpm. It was located right to the driver, and coupled with a cross-drive transmission for better agility but the steering was old-fashioned with its vertical handles to let drivers accustomed to track clutching/braking to steer the vehicle after a shortened training. 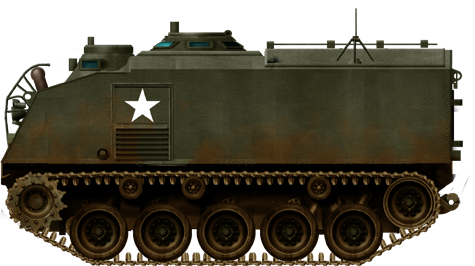 The welded steel hull was relatively thick for an APC, up to 2 inches (50 mm) on the front, and 1 to 2.5 inches (25 to 38 mm) sides, roof and bottom, and therefore still 42,000 pounds (19,051 kg) loaded. The driver could see through three M17 periscopes and prismatic blocks, and later an M19 infra-red night vision periscope, while the commander located in the center behind had 6 prismatic vision blocks around his hatch. The cupola was normally fitted with a ring-mounted M2HB cal.50 (12.7 mm) heavy machine gun, with 1800 rounds in store. The rear bay could accommodate ten fully-equipped soldiers, along with an M20 Super Bazooka and 10 spare rockets, as well as large provisions of bullets for the M1 Garand/M2 carbine. During trials, the M75 showed it could ford a 48 in deep river (80 with a fording kit), climb a vertical obstacle on 18 in and 60% gradient slope, or cross a trench 66 inches wide. In total, International Harvester Corporation and its subsidiary produced together 1729 APCs, from 1952 until February 1954. 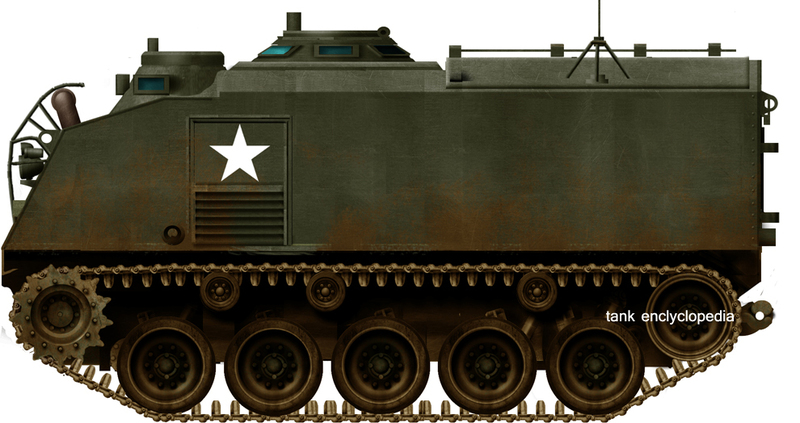 These were the first mass-produced American APCs and formed the basis on which were extrapolated other models, namely the well-simplified M59 (1953) which was amphibious, simpler and cheaper, and of course the record-breaking M113 (1960) which replaced both and was produced to a staggering 80 000 units. The production was uniform and apparently, no variant or derivative vehicle is known. A handful of M75s was given to infantry units operating in Korea, starting in mid-1953. This experience led to raising some issues with the model, which was heavy, tall, with too vulnerable engine air cooling vents. On top it was also costly: The production was cut short due to a tag price of 72 000 $. But it had a far more reliable drive system compared to the M59. Most of the models were kept for training, auxiliary duties, and 600 given as a military aid to Belgium, the only country outside the US to use it. Belgian M75s were kept in service until the 1980s, in units like the Chasseurs Ardennais they operated with French AMX-13 VCIs. By 1990, still, 77 were enlisted. 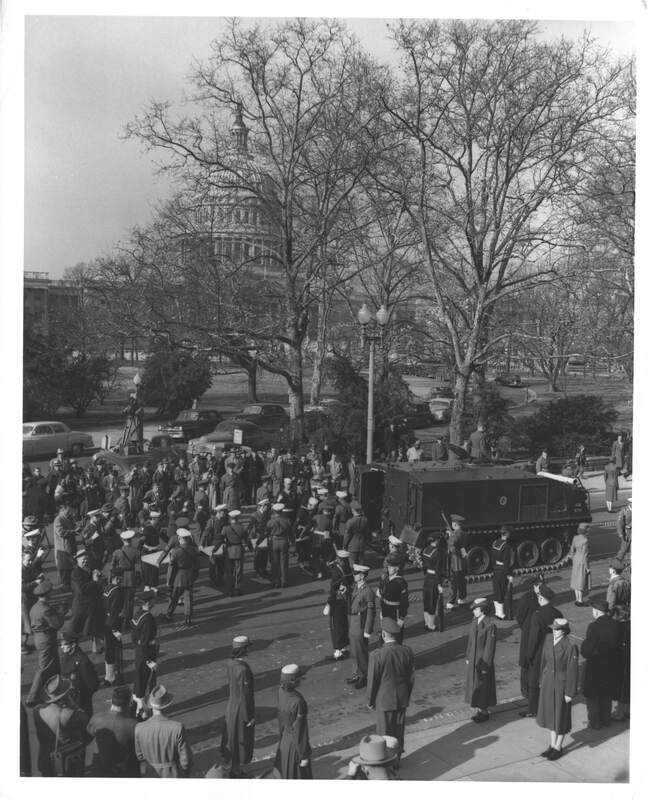 In December of 1952, an M75 APC was employed for the transfer of the original United States’ Declaration of Independence and Constitution to the National archives, where they are on display to this day. Propulsion Continental AO-895-4 6-cyl. gas. 295 hp. 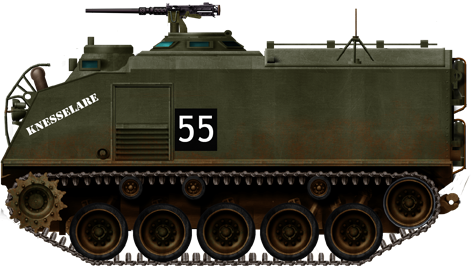 M44 Armoured Personnel Carrier (1945). 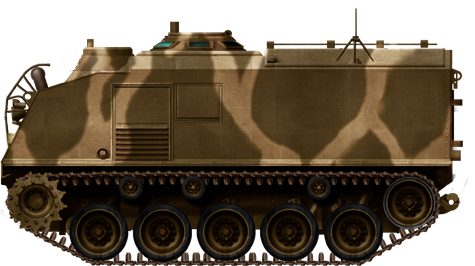 This early vehicle was massive, and not “squad-size”, but served as the basis for the cold war M75 and M59. M75 Armoured Personnel Carrier, on trials in 1952. M75 in Belgian service in the 1970s, now preserved. Camouflaged M75 on display on a museum, the livery is probably an hypothetic recreation. Camouflaged M75 used for exercises at the Idaho Motor pool. First Paragraph Thoroughly is spelled wrong excellent article though!!! This has been fixed, and thank you!